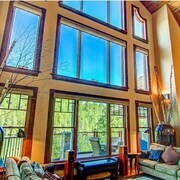 Situated in Val-des-Monts, this property is in the same region as Sommet Edelweiss and Morrison’s Quarry. 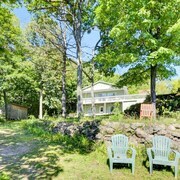 Private Sandy Beach, Family Retreat! 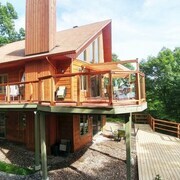 Situated in Val-des-Monts, this property is in the same region as Sommet Edelweiss. This downtown Ottawa hotel is 2 blocks from Parliament Hill; 1 block from the National Arts Centre; 5 blocks from Byward Market. Central location and newly renovated classy hotel. we arrived early and our rooms were ready. Staff were wonderful and accommodation. Rooms were very clean. Where to find Val-des-Monts hotels near an airport? Where can I find hotels in Val-des-Monts that are near tourist attractions? There isn't a broad range of Expedia-accredited hotels that are less than 0.1 kilometres (0.06 miles) from Val-des-Monts, so book ahead of time if you are thinking of staying in a centrally located Val-des-Monts hotel. The Hilton Lac-Leamy, Quebec, which is the nearest accommodation, sits 25 kilometres (15 miles) from downtown Val-des-Monts. Another close option is the Fairmont Chateau Laurier, situated in Ontario, which is 25 kilometres (17 miles) from downtown Val-des-Monts. You could try the The Westin Ottawa and the Moulin Wakefield Mill Hotel & Spa. 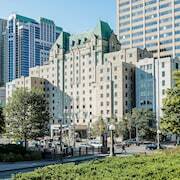 The The Westin Ottawa is positioned 25 kilometres (17 miles) from the heart of Val-des-Monts. The Moulin Wakefield Mill Hotel & Spa, is 20 kilometres (13 miles) away. Two more hotels are the Residence Inn by Marriott Ottawa Downtown and the Delta Hotels by Marriott Ottawa City Centre. The closest hotels in Gatineau include Wakefield and Buckingham. Wakefield is 20 kilometres (12 miles) to the west of Val-des-Monts, while Buckingham is 20 kilometres (13 miles) to the southeast. Hotels in Wakefield are the Auberge De Mon Petit Chum B&B and Alpengruss Cafe & Motel. The Motel du Parc Masson and Motel Les Pignons Verts are the accommodation options in Buckingham. If you like sports and love watching games you might like to head to Canadian Tire Centre, which is 45 kilometres (28 miles) to the southwest of Val-des-Monts. Stay close to the action at the Holiday Inn Hotel & Suites Ottawa Kanata or the Fairfield Inn & Suites by Marriott Ottawa Kanata. Macdonald-Cartier International Airport is a logical airport, and is located 40 kilometres (24 miles) from Val-des-Monts. 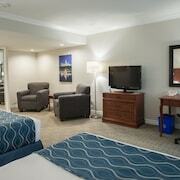 Conveniently located hotel options are Days Inn Ottawa Airport and Holiday Inn Express Hotel & Suites Ottawa Airport. What are the most popular Val-des-Monts hotels? 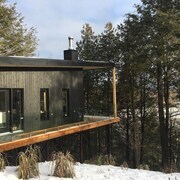 Are there hotels in other cities near Val-des-Monts? What other types of accommodations are available in Val-des-Monts? Explore Val-des-Monts with Expedia.ca’s Travel Guides to find the best flights, cars, holiday packages and more!